Feeling bummed about your small kitchen? There are many creative ways you can make the most of your cramped quarters by maximizing your storage. There are a few ingenious hacks that will ensure that your kitchenware is put away when space is at a premium. Here are 10 space saving ways to store pots and pans. One of the easiest space saving ways to store pots and pans! 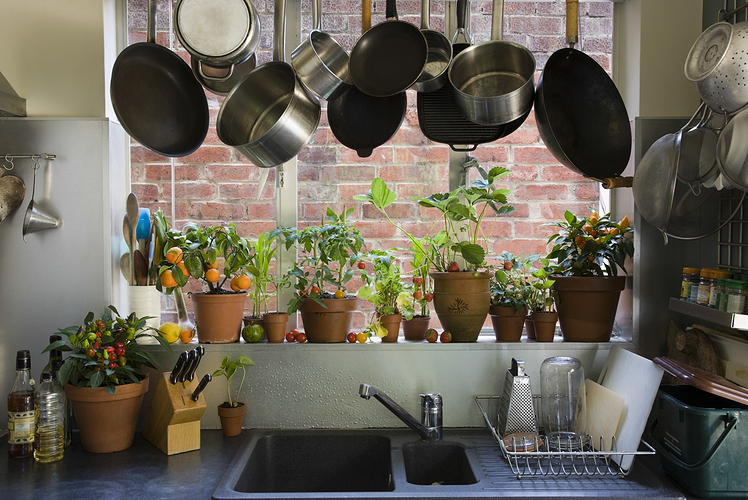 If you’re looking to find a spot to put away your pots and pans, try hanging them on a steel rod by your window. This way you’re not taking away valuable wall space, while adding some DIY charm to your kitchen. 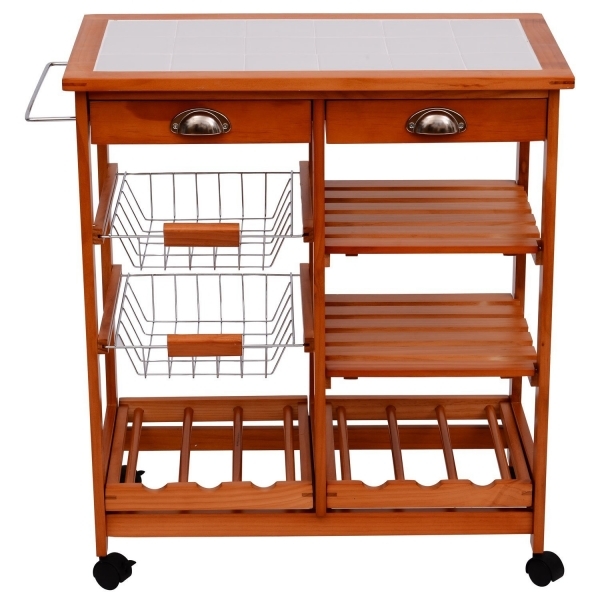 Find a cute rolling cart and you’ll have some stylish storage space. Paint it with an accent color which works with the color scheme of your kitchen and you’ll have an instant conversation piece. 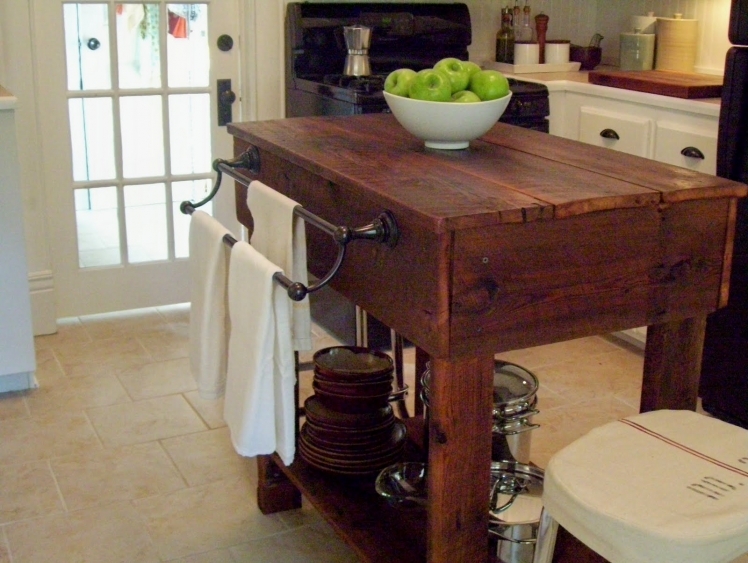 Plus, one advantage of using a cart with wheels is that you can have all your kitchen supplies easily accessible. 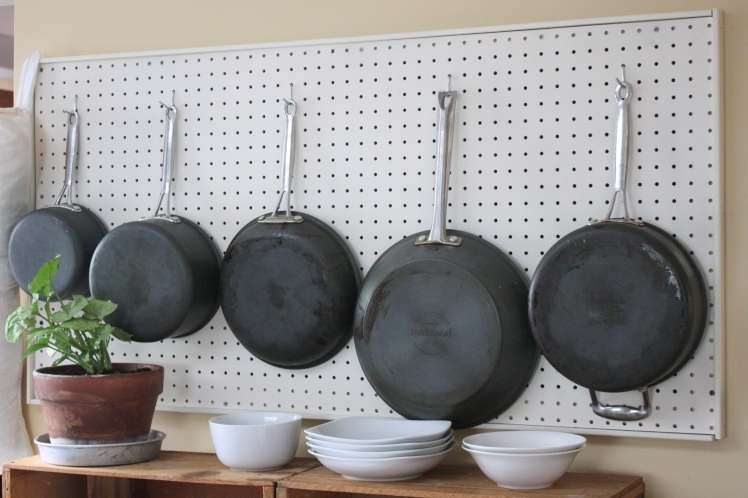 One of the cheapest space saving ways to store pots and pans is by hanging them on pegboard. Julia Child first made this DIY form of kitchen organization famous and it has continued to be a popular form of storage since. While you don’t need to be an expert woodworker to put this wall storage together, it’s important that you use proper hardware or you’ll risk having the whole thing collapse. Apartment Therapy has a simple pegboard wall organizer project that anyone can follow. Installing a restaurant-style rack above a kitchen island is one of the most commonly-used space-saving ways to store pots and pans. Not only can it be an effective form of storage, but it also makes for a bold statement piece. Just make sure it isn’t covering any light fixtures. If so, you can always incorporate lighting into your hanging storage rack. 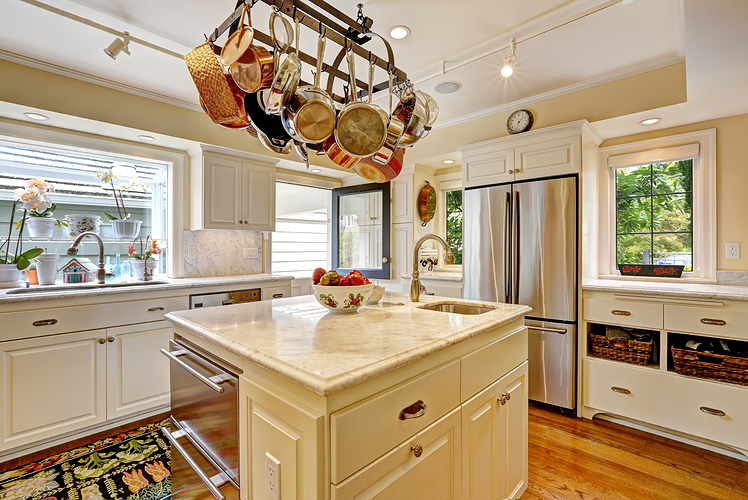 Alternatively, you can also save a lot of space by storing your pots and pans on a shelf underneath your island. It also provides easy access to your favorite housewares. This will be incredibly convenient for the shorter chefs in your family. 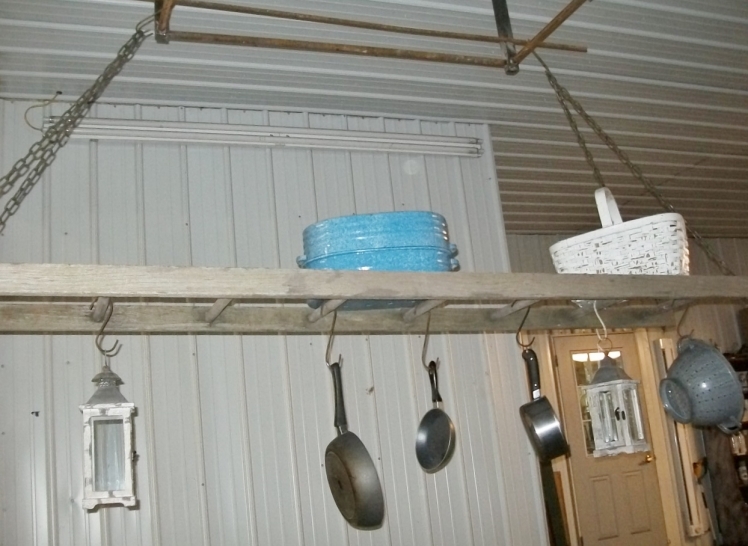 One of the more rustic space saving ways to store pots and pans is by simply hanging them on a repurposed ladder. 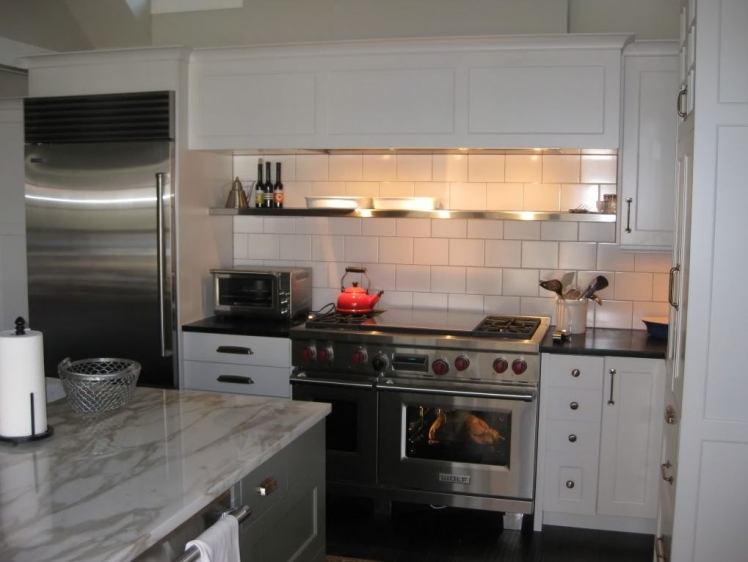 You can leave the ladder au naturel or paint it a color that matches your kitchen’s color scheme. 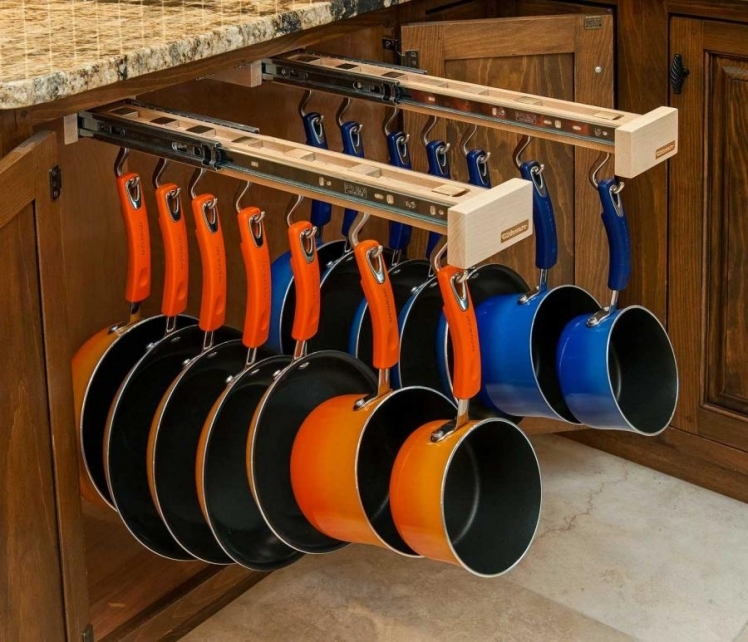 Sliding your cookware into your cabinets using an ingenious sliding organizational system is one of the more expensive space-saving ways to store pots and pans. If you have some extra room in your household budget, this is definitely the way to go. Make effective use of the empty space above your range by installing a shelf to store your kitchenware. 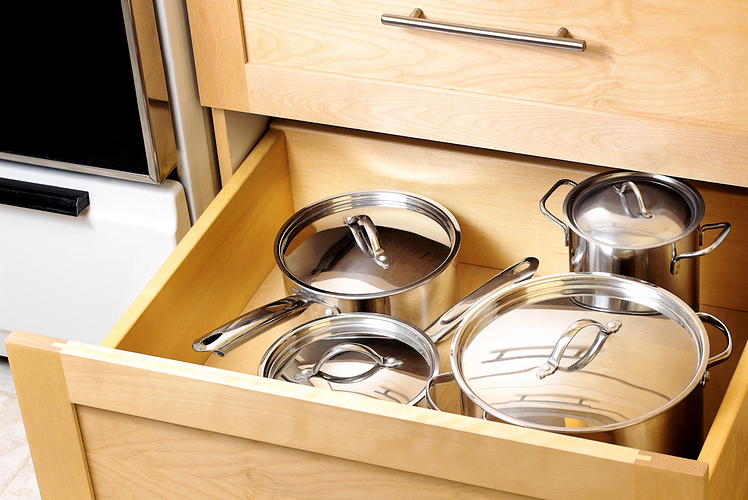 Not only does it maximize space, but it also gives your pots and pans a convenient home right by your oven. Just make sure that you’re proud of your kitchenware collection. They’ll be on display for all to see, so if your pots and pans are banged up, you might want to invest in a new set. One of the more discrete space saving ways to store pots and pans is by tucking them away in a deep drawer. While this may be a simple and effective way to give your pots and pans a home, if you’re an avid home cook, you have enough drawers so that you can organize your pots and pans in one layer in order to make them easier to find and pull in and out. Corner cabinets are an often underutilized space in many kitchen, yet when used effectively, they can be an ideal spot to store your cookware. 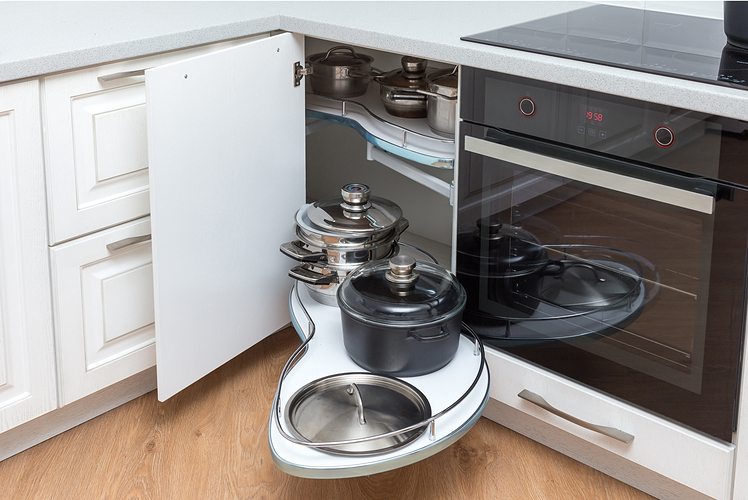 This is even more true if you install a wire-rack lazy Susan, which is one of the most convenient space saving ways to store pots and pans as it also allows for easy access to whatever you need.